I’ve talked about this before, but this winter is turning out to be rather different from last winter–in two ways. Not this year. Not yet, anyway. Last year was cold, snowy, and more snowy. 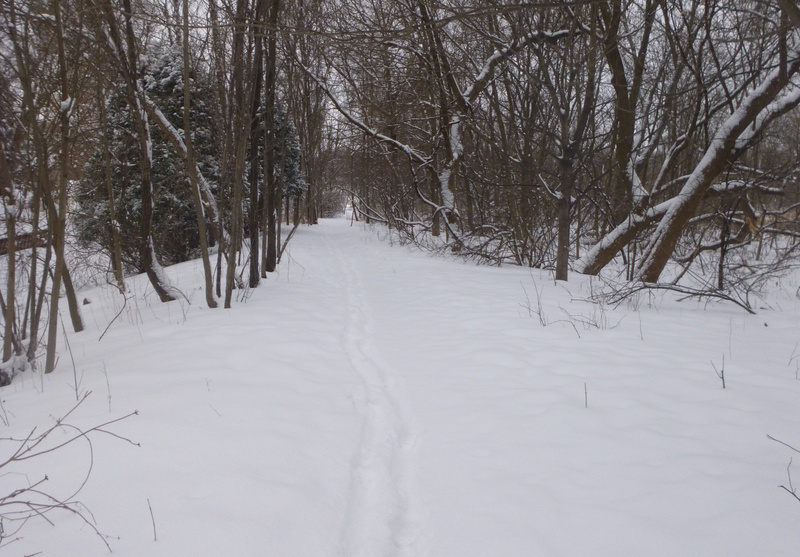 By the end of January, I’d spent almost 40 hours riding the fat-bike in the snow. Much of that time was spent riding on the frozen lakes. This year, we’ve had some snow, but it’s been interspersed with warmer weather, so very little snow pack has developed. Conditions for lake riding have been mostly dismal; there’s plenty of ice, but all too often it’s been bare or semi-bare of snow. It’s the second difference that’s really hit home with me. I just haven’t felt like riding as much as I did last year. In part, this is due to the less-than-awesome snow conditions and the corresponding increase in sandy pavement, half-frozen brown grass, and bare lake ice–all of which means that the riding is less fun (because riding a fat-bike in fresh snow on the lake is fun) while the bikes get even dirtier. But I also have to wonder if I’ve finally grown tired of winter after forty-plus years of playing in the snow. My most persistent cycling-related fantasies of late have centered around selling off all but a couple of bikes and moving to a place where the only way to get snow and ice in the winter is to head into the mountains. Of course, I’ll probably forget about all of that if we get six inches of good snow over the weekend. I feel ya. I have the opposite out here in the temperate Northwest. Sometimes I’m all like “move back to a place with REAL winter”. Then we get a week like the last, where for a few days I was riding around in short-sleeves. And I say to myself: Do I really want REAL winter again? I looks like it just might, at that. Forecasts are calling for as much as 10 inches of snow between tonight and tomorrow night. The fat-bikes and snowshoes are at the ready.